The heat stress suffered by Leishmania sp during its digenetic life-cycle is a key trigger for its stage differentiation. In Leishmania subgenera two classes of HSP70 genes differing in their 3' UTR were described. Although the presence of HSP70-I genes was previously suggested in Leishmania (Viannia) braziliensis, HSP70-II genes had been reluctant to be uncovered. Here, we report the existence of two types of HSP70 genes in L. braziliensis and the genomic organization of the HSP70 locus. RT-PCR experiments were used to map the untranslated regions (UTR) of both types of genes. The 3' UTR-II has a low sequence identity (55-57%) when compared with this region in other Leishmania species. In contrast, the 5' UTR, common to both types of genes, and the 3' UTR-I were found to be highly conserved among all Leishmania species (77-81%). Southern blot assays suggested that L. braziliensis HSP70 gene cluster may contain around 6 tandemly-repeated HSP70-I genes followed by one HSP70-II gene, located at chromosome 28. Northern blot analysis indicated that levels of both types of mRNAs are not affected by heat shock. This study has led to establishing the composition and structure of the HSP70 locus of L. braziliensis, complementing the information available in the GeneDB genome database for this species. L. braziliensis HSP70 gene regulation does not seem to operate by mRNA stabilization as occurs in other Leishmania species. The Leishmania genus involves about 20 species that infect humans, causing different clinical manifestations ranging from self-healing cutaneous lesions (CL), mucosal lesions (MCL) to fatal visceral infections (VL) . More than 350 million people are considered at risk of contracting leishmaniases, and some 2 million new cases occur yearly . In Latin America, CL and MCL are neglected public health problems endemic in 22 countries. Many species of the subgenus Viannia cause the majority of CL cases but MCL is principally caused by Leishmania (Viannia) braziliensis. Canine leishmaniases, caused either by Leishmania infantum or by L. braziliensis, is also widespread in South America, being among the most important canine vector-borne diseases occurring in this region . During its digenetic life cycle, the Leishmania parasite needs to adapt from the environmental (vector) temperature to the mammalian-host temperature (37°C). As a result, the heat shock response is induced and the heat shock proteins (HSPs) are expected to play important roles in the adaptation process, influencing the developmental change from promastigotes in sandflies to amastigotes in mammalian hosts [5–10]. Among HSPs, HSP70 is the most highly conserved in both sequence and function. Proteins of the HSP70 family are central components of many fundamental cellular processes, including the folding and assembly of newly synthesized proteins, refolding of misfolded and aggregated proteins, membrane translocation of organellar and secretory proteins, proteolytic degradation of unstable proteins, and control of regulatory protein activity [11–14]. Two classes of HSP70 genes, HSP70-I and HSP70-II, sharing the 5' untranslated region (UTR) and the coding region but differing in their 3' UTR, have been described in several Leishmania species like L. infantum, Leishmania major, Leishmania tropica, Leishmania mexicana and Leishmania amazonensis[15, 16]. In general, these genes are arranged in a single genomic cluster that contains five or six HSP70-I copies, followed by one HSP70-II copy. In L. infantum, it has been demonstrated that whereas HSP70-I mRNAs accumulate in response to heat shock treatment, and are translated at both 26 and 37°C, HSP70-II mRNAs do not show a temperature-dependent accumulation, but show preferential translation at heat shock temperatures . Given that Leishmania genes are transcribed into polycistronic RNA precursors that need to be further processed into individual mRNAs by trans- splicing and polyadenylation, post-transcriptional regulation represents the main level of controlling gene expression in these parasites . Currently, multiple efforts are being dedicated to identify cis- and trans- elements involved in the modulation of mRNA processing, mRNA stabilization/destabilization, mRNA half-life, or translation efficiency. Although regulatory sequences have been identified in both 5' and 3' UTRs, most of them have been located in the 3' UTRs [18–23]. For instance, preferential translation of HSP83 in Leishmania requires a thermosensitive polypyrimidine-rich element (PPT) in the 3' UTR . Our knowledge on the organization and expression of HSP70 genes in Leishmania species of the subgenus Viannia is scanty. Although, the sequence for the L. braziliensis genome has recently been published , unfortunately, the genomic sequence found in the GeneDB database presents several gaps that hinder to elucidate the organization of the HSP70 locus in L. braziliensis. Moreover, in a preliminary work, it was documented by hybridization assays the existence of HSP70-I genes in L. braziliensis, but evidence on the presence of HSP70-II genes was not obtained . In this work, we have determined the 5' and 3' UTRs for the HSP70 L. braziliensis genes, demonstrating the existence of the HSP70-II gene in this Viannia species, and established the organization of the HSP70 locus. Also the expression of both types of HSP70 genes was assessed. Promastigotes of L. braziliensis ( MHOM/BR/75/M2904) were cultured in vitro at 26°C in Schneiders`s insect medium (Sigma Aldrich, Inc., St. Louis, USA) supplemented with 20% heat-inactivated fetal calf serum (Eurobio, Inc., Les Ulis, France), and 0.1 μg/mL of 6-Biopterin (Sigma Aldrich, Inc., St. Louis, USA). For heat shock treatments, 10 mL-aliquots of L. braziliensis promastigote cultures at logarithmic phase (5-9 × 106 promastigotes mL-1) were transferred into 50 mL flasks, and incubated at 32°C, 35°C or 37°C for two hours. Afterwards, parasites were harvested for DNA or RNA extraction. Total DNA from L. braziliensis cells was isolated using the phenol-chloroform-isoamilic alcohol method . Two μg of DNA were digested with several restriction enzymes according to the manufacturer specifications (Promega, Inc., Madison, WI, USA), electrophoresed on 0.8% low electroendosmosis agarose gels (Conda Pronadisa, Inc., Madrid, Spain), and transferred to nylon membrane (Roche, Inc., Mannheim Germany) by standard methods . Total RNA from promastigotes was isolated using the Total Quick RNA Cells and Tissues (TALENT, Inc., Trieste, Italy). Four μg per line were separated on 1.5% (w/v) low electroendosmosis agarose/MOPS/formaldehyde gels and transferred to nylon membranes. L. braziliensis chromosomes were prepared from promastigotes, harvested during log phase, washed and embedded in 0.6% low melting agarose (GIBCO BRL, Inc., N.Y, USA) plugs, which were finally soaked in a lysis solution (0.5 M EDTA, pH 9; 1% SDS, 1 mg/mL proteinase K) at 50°C during 48 h.
After three washes with 0.2 M EDTA for 2 h each one, the blocks were loaded directly into the wells of 1% agarose NA gel (Amersham Bioscience, Inc., Uppsala, Sweden), sealed in place, separated by pulsed homogeneous electric field gel electrophoresis (PFGE) using a Pharmacia Biotech Gene Navigator apparatus at 100 V, 120° separation angle and switch times varying from 100 s/7 h; 200 s/10 h and 500 s/20 h, and transferred to nylon membranes. The following probes were used: 3' UTR-I (clone pTLb3HSP70-D, Sma I/Eco RI digested), 3' UTR-II (clone pTLb3H70-11B, Hin cII/Eco RI digested), and intercoding (IR-HSP70, clone pLbHSP70-IR-E, Pst I digested). They were labeled with digoxigenin by randomly primed synthesis using the DIG High Prime DNA Labeling kit (Roche, Inc., Mannheim, Germany). Hybridizations and immunological detection were performed using the Detection Starter kit II (Roche, Inc., Mannheim, Germany) according to manufacturer's instructions. Finally, membranes were exposed on Curix RP2 plus medical X-Ray film (AGFA, Mortsel, Belgium). First-strand cDNA synthesis was carried out from L. braziliensis total RNA using an oligo-dT primer and a cDNA synthesis kit (LKB Pharmacia, New Jersey, USA). Amplification of the UTRs was performed from poly-T primed-cDNA using specific primers: LbSL (5'CGCTATATAAGTATCAGTTTC3') and Lb181 (5'TGCAACCCGATCATGACCAAG 3') for the 5' UTR, and Lb1824 (5'GATCATGACCAAGATGTACCAGAG 3') and Poly T Eco RI (5'CGGAATTCTTTTTTTTTTTTTTTTTTT 3') for the 3' UTR-I (see Additional file 1). Briefly, 20 μL reactions containing 2 μL of cDNA, 1X reaction buffer (10 mM Tris-HCl pH 9.0, 50 mM KCl, 0.1% Triton X-100), 1.5 mM MgCl2, 0.7 mM of dNTP mix, 0.2 μM of each primer, 2 M betain, and 0.06 units per μL of expand high fidelity enzyme (Roche, Branford, USA) were prepared. For 3' UTR-II amplification, 1 mM MgCl2 and 0.5 μM of each primer were used. An MJ Research PTC-100 DNA thermocycler was used for the reaction with the following amplification profile: 95°C/5 min (initial denaturation), 35 cycles at 92°C/0.5 min, 58°C/0.5 min and 72°C/1 min, with a final incubation at 72°C for 10 min. All the amplified fragments were resolved in agarose gels and visualized under UV exposure after ethidium bromide staining. RT-PCR products were excised from gels, purified using GFX Gel Band Purification kit (Amersham Biosciences, GE Healthcare, Chalfont St. Giles, Buckinghamshire, England) and cloned in the pGEM®-T Easy plasmid (Promega, Madison, WI, USA); pCR®II (Invitrogen, California, USA) or pCR2.1 (Invitrogen, California, USA) plasmids. The following clones were obtained: pLbHSP70-5B containing the 5' UTR, pTLb3HSP70-D for the 3' UTR-I, pLb3H70-11B for the 3' UTR-II, and pLbHSP70-IR-E for the intercoding region. The sequences were determined using the Big Dye Terminators v3.1 kit (Applied Biosystem, California, USA) by automatic sequencing at the Servicio de Genómica (Parque Científico de Madrid, Universidad Autónoma de Madrid). In order to deduce the HSP70 mRNA UTRs from other Leishmania species LALIGN (http://www.ch.embnet.org/software/LALIGN_form.html) analyzes were performed. A ClustalW analysis (http://www.ebi.ac.uk/Tools/clustalw2/index.html) for multiple alignments of sequences, were carried out to determine the similarity among them. Gene structure and expression of the HSP70 protein have been well characterized in L. infantum[7, 15, 16, 27] and other trypanosomatids of medical importance as L. major, Trypanosoma brucei[29, 30], and Trypanosoma cruzi[31–36]; nonetheless, little is known about their genes in L. braziliensis. A previous study showed the presence of the HSP70-I genes in this parasite; however, it was not determined their copy number. These authors also reported that using the 3' UTR-II region from L. infantum as probe, it was not possible to detect the presence of HSP70-II genes in L. braziliensis. In order to determine the genomic organization of HSP70 genes in L. braziliensis, we searched in the L. braziliensis genome database at GeneDB for entries containing HSP70 sequences. 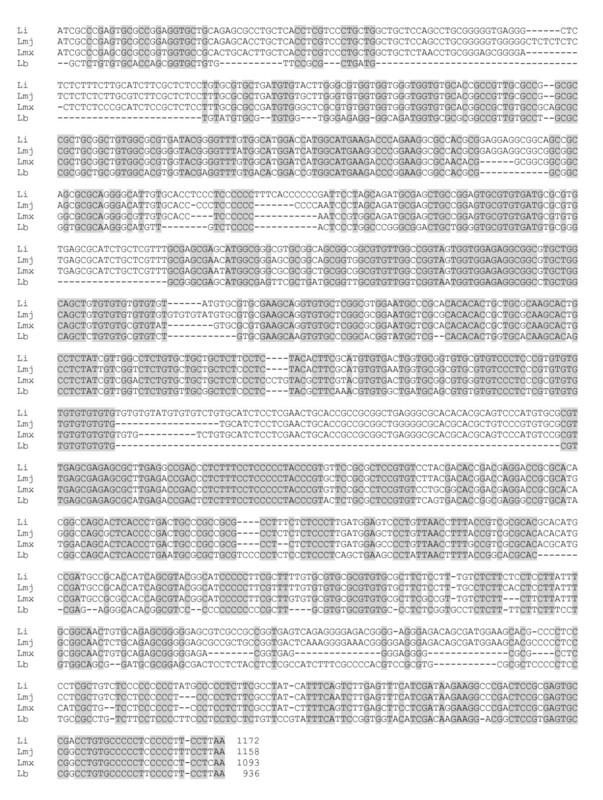 One complete HSP70 gene (GeneDB ID: LbrM28_v2.2990) and two incomplete sequences, LbrM28_v2.2980 (bearing a 5'-fragment of the gene encoding the N-terminal region of HSP70) and LbrM28_v2.2970 (encoding the C-terminal protein region) were found (Figure 1). Between both fragments of HSP70 genes, a sequence gap of undetermined length is annotated in the database. Even though LbrM28_v2.2980 and LbrM28_v2.2970 might be part of the same gene, the sequenced regions do not overlap. All three sequences are tandemly organized on the minus strand of chromosome 28. No other entries for HSP70 genes were found in the L. braziliensis database. This genomic organization of the HSP70 genes in L. braziliensis resembled that found in other Leishmania species of the subgenus Leishmania, i.e. a locus containing tandemly repeated HSP70 genes . However, tandem gene arrays are among the most challenging to resolve correctly using current genome sequencing technology, since repetitive sequence reads tend to collapse into a single contig when no variation exists to distinguish them. Thus, in order to determine the copy number of HSP70 genes composing the locus, and possible sequence divergence existing between the different genes, we designed specific oligonucleotides to cloning the complete intercoding regions (UTRs+intergenic regions), from genomic DNA, and also the 5'- and 3'-UTRs by RT-PCR from poly-A+ RNA (see Methods section for further details). A single amplification fragment for the intercoding region was obtained and, after cloning, its sequence was found to be conserved (99.8% of sequence identity) with the sequence located between genes LbrM28_v2.2990 and LbrM28_v2.2980. These findings suggest a high conservation of intercoding regions in the HSP70 locus; however, a more accurate determination of degree of conservation would require the sequencing of several additional clones. On the other hand, using RT-PCR and specific oligonucleotides, it was possible to determine the 5' UTR sequence, which is 198 bp in length (Figure 2). This sequence has been deposited in the GenBank database under the accession number JF449363. In spite of the high sequence identity, among the four sequences analyzed, two microsatellite length polymorphisms in the 5'-UTR were observed (see Additional file 2), suggesting the existence of allelic polymorphisms in the L. braziliensis HSP70 locus. In addition, the alignment of the 5' UTR with the genomic sequences allowed us to deduce that the AG splicing acceptor is located 194 and 199 nucleotides upstream of the start codon of LbrM28_v2.2990 and LbrM28_v2.2980 genes, respectively. Also, in both entries, 28 nucleotides upstream of the splicing acceptor site, an identical polypyrimidine tract of 22 nucleotides in length (5' CTCCCCTTTCTCT CTCTGCCCC 3') with a U/C ratio of 0.62 is observed. It is likely that this polypyrimidine tract is relevant for the trans-splicing process. Furthermore, in the coding regions contained in clones pLbHSP70-IR-E and pLbHSP70-5B, two transitions of guanine by adenine were found. The first one causes a change of cysteine by tyrosine, and the other produces a change of glutamic acid by lysine in the encoded polypeptides (Additional file 2). This variability, together with the microheterogenicity detected in the 5' UTR, supports the existence of at least four HSP70 genes in the diploid genome of L. braziliensis; but this resulted to be an underestimation as we demonstrate below. Position and sequence of the 5´ UTR of HSP70 cluster from L. braziliensis. (A). Graphical representation of the 5' UTR position in the HSP70 cluster of L. braziliensis. (B). 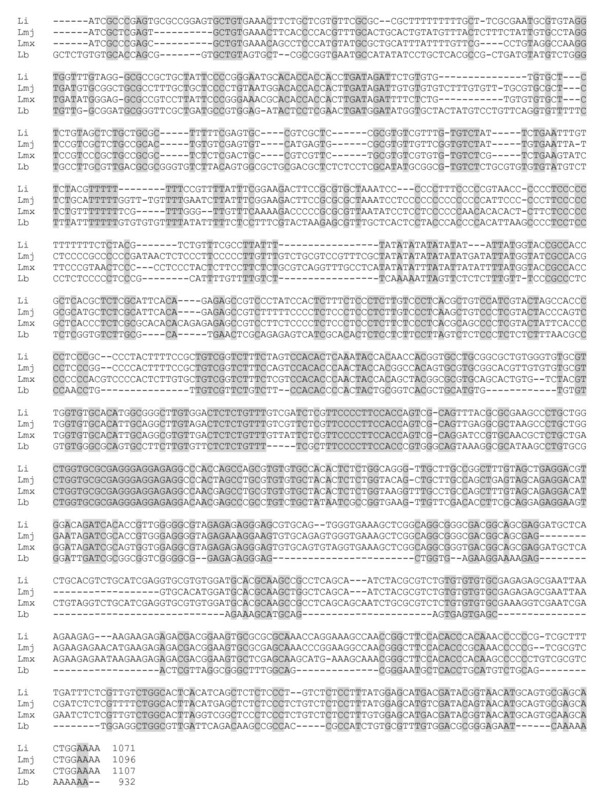 Multiple sequence alignment among HSP70 5' UTR from L. braziliensis (Lb: JF449363), L. major (Lmj: LmjF28.2770), L. infantum (Li: LinJ28_V3.2960) and L. mexicana (Lmx: LmxM28.2770). Conserved sequences are shaded in gray. Regarding the 3' UTR of HSP70 genes, two types of sequences were cloned and sequenced (GenBank JF449364 and JF449365), showing a high sequence divergence each other. After sequence comparison, they could be assigned to the two types of 3' UTR (I and II) described in HSP70 genes of other Leishmania species (Figures 3 and 4). Thus, we determined that the 3' UTR type I is 936 nucleotides long, and would correspond to the LbrM28_v2.2990 entry (and possibly other genes of the HSP70 gene cluster, see below), and the 3' UTR type II is 932 nucleotides long and would be associated with LbrM28_v2.2970 entry. The 3' UTR-II was found 100% identical with the genomic sequence located downstream of LbrM28_v2.2970, whereas the 3' UTR-I had 99.1% of sequence identity with the sequence located downstream of LbrM28_v2.2990 entry, suggesting that the cloned 3' UTR-I might correspond to other HSP70 gene in the cluster (see below). According to the 3' UTR-I sequence, the polyadenylation in the LbrM28_v2.2990 transcript would occur after two adenines, and 187 bp upstream of the putative polypyrimidine tract previously mentioned. Regarding the LbrM28_v2.2970 gene, the polyadenylation would take place, after an A-rich region of 11 residues, and 154 bp upstream of a C-rich polypyrimidine tract of 14 nucleotides in length and U/C ratio of 0.08 (5'CCCCCCCCCTCCCC 3'). It is a common feature that the presence of adenosine residue precedes the polyadenylation sites of a large number of trypanosome mRNAs . It is believed that poly(A) polymerases prefer an initial adenosine residue for attachment of the poly(A) tail, and the selection of the polyadenylation site would be strengthened by the presence of adenosine residues . Graphical representation of the 3' UTR-I position in the HSP70 cluster of L. braziliensis. Multiple sequence alignment among HSP70 3' UTR-I from L. braziliensis (Lb: JF449364), L. major (Lmj: LmjF28.2780) , L. infantum (Li: LinJ28_V3.2960) and L. mexicana (Lmx). Conserved sequences are shaded in gray. L. major 3' UTR-I sequence was deduced by comparison with L. infantum and L. braziliensis 3' UTR-I sequences. Additional file 3, shows the sequence information, currently available in the GeneDB database, that was used for assembling of the putative L. mexicana 3' UTR-I sequence. After determining the extent of the UTRs, it was possible to define the intergenic region (IR) within the L. braziliensis HSP70 locus. The IR, not included in the mature mRNA, is defined as the sequence beginning downstream of the polyadenylation site and ending immediately upstream of the spliced leader acceptor site of a downstream gene. Thus, the IR between LbrM28.2990 and LbrM28.2980 genes was found to be 237 nucleotides in length; this region was almost identical (99.6%) to that cloned for this work (pLbHSP70-IR-E clone, GenBank accession number JF449366), suggesting a high degree of conservation of this region along the HSP70 cluster. The characterization of UTRs for L. braziliensis HSP70 genes (Figures 2, 3 and 4) has evidenced the existence of a remarkable conservation of the HSP70 locus along the genus Leishmania, extending previous studies  to a species of the Viannia subgenus. The 5' UTR cloned in this work was found to be highly conserved with the equivalent regions of the LbrM28_v2.2990 and LbrM28_v2.2980 genes (98% and 99.5%, respectively). The comparison with the HSP70 5' UTR of other Leishmania species showed also a remarkable sequence identity (77-81%). Noticeably, this region was well conserved among all Leishmania species analyzed except for two exclusive sequences of L. braziliensis (Figure 2). Comparison of the 3' UTR-I from L. braziliensis with those from other Leishmania species revealed identities between 71-73%. Furthermore, stretches of identical nucleotides are present in the 3' UTR-I in all the species analyzed (Figure 3 and 4). Again, it was found that L. braziliensis sequence is the most divergent among the analyzed sequences. Thus, the L. braziliensis 3' UTR-I lacks several regions common to the other Leishmania species; in particular, there are two important sequence gaps, of 60 and 77 nts, located at the beginning and the middle of the region, respectively (Figure 3 and 4). In contrast to the 3' UTR-I, the 3' UTR-II from L. braziliensis showed to be more divergent, having only a 55-57% of identity with the other species analyzed. Indeed, some sequences at the first half of the region were exclusive for L. braziliensis (Figure 5 and 6). Conversely, it was found that L. braziliensis sequence lacks several regions common to the other Leishmania species, especially in the second half of the region (Figure 5 and 6). Nevertheless, the presence of several short stretches of identical sequences among all the species analyzed was also found (Figure 5 and 6), suggesting a common evolutionarily origin. Graphical representation of the 3' UTR-II position in the HSP70 cluster of L. braziliensis. Multiple sequence alignment among HSP70 3'UTR-II from L. braziliensis (Lb: JF449365), L. major (Lmj: LmjF28.2770) , L. infantum (Li: LinJ28_V3.3000) and L. mexicana (Lmx: LmxM.28.2770). Conserved sequences are shaded in gray. L. major and L. mexicana sequences were deduced by comparison with L. infantum and L. braziliensis 3' UTR-II sequences. The identification of two divergent 3' UTR sequences for HSP70 genes in L. braziliensis and their comparison with the sequences in the GeneDB database allowed us to define the existence of two types of HSP70 genes, a question that remained to be solved . Northern blot assays using different probes were performed in order to elucidate the expression of these genes in L. braziliensis. 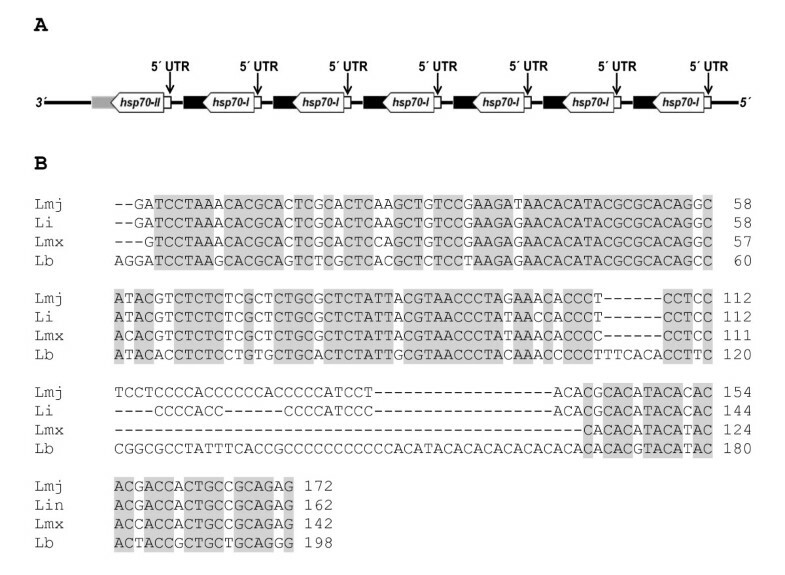 Using the IR-HSP70 probe, containing the complete 3'-UTR-I together with 5'-UTR and short fragment of the coding region, two hybridization RNA species of very similar size were observed (Figure 7). In addition, a slight hybridizing fragment of about 5.6 kb was observed in all lanes, but its signal became stronger when parasites were incubated at 37°C; accumulation of additional high molecular RNA species was also observed with this treatment (Figure 7A). It is likely that those fragments are representing RNA precursors (pre-mRNA), whose processing is disturbed by heat shock. The use of probes specific for 3' UTR-I and UTR-II allowed us to show the existence of both types of transcripts: the HSP70-II mRNA, which corresponds to the upper RNA in figure 7A, and the HSP70-I mRNA, which corresponds to the lower one. Of special interest, both types of transcripts did not show accumulation under heat shock treatment (Figure 7). Identification of HSP70-I and HSP70-II transcripts of L. braziliensis. Four micrograms of total RNA isolated from promastigotes incubated for 2 h at the indicated temperatures were separated on denaturant 1.5% agarose/MOPS/formaldehyde gel, blotted and hybridized with the H70-IR-E (A), 3' UTR-I, and 3' UTR-II (B) probes. As load control, the agarose gels were stained with ethidium bromide (rRNA panels). In order to estimate the number of HSP70 genes in the L. braziliensis locus, a Southern blot analysis was carried out (Figure 8). L. braziliensis total DNA was either totally or partially digested with selected restriction enzymes, and, after electrophoretic separation and transferring, hybridized with specific probes. A prominent 3.3-kb fragment was observed after digesting DNAs with either Sma I- or Bam HI and hybridizing with the intercoding probe (H70-IR-E; Figure 8A), indicating that indeed the HSP70 locus in L. braziliensis should consist of tandemly repeated genes with a repetition unit of 3.3-kb. Additional fragments, showing lower hybridizations signals, were interpreted as representing the boundaries of the locus (Figure 8A, lane 3, and 8B, lanes 3, and 4). The tandem organization of the locus was demonstrated by Bam HI partial digestion of L. braziliensis DNA; a typical ladder was observed (Figure 8A, lanes 5 to 8). Genomic organization of HSP70 genes from L. braziliensis. DNA from promastigotes was totally or partially digested with restriction enzymes and the resulting fragments were separated on a 0.8% agarose gel, transferred to nylon membrane and hybridized with the H70-IR-E probe (A). The same blot was stripped and rehybridized with the HSP70-3' UTR-II probe (B). Lanes: 1, 185 ng of λ DNA Hind III; 2, 300 ng of Xho I-digested DNA; 3, 1 μg of Xho I+Sma I-digested DNA; 4, 1 μg of Xho I+Bam HI-digested DNA; 5 to 9, DNA digested with Bam HI for 2 min (lane 5), 5 min (lane 6), 15 min (lane 7), 30 min (lane 8), and 3 hours (lane 9); lane 10, 140 ng of Φ29 DNA+Hin dIII. Molecular weight markers (lane 1 and 10) were labeled with digoxigenin and used as a probe in the hybridizations. (C) Pulsed field gel electrophoresis showing ethidium bromide staining of S. cerevisiae (lane 1), and L. braziliensis chromosomes (lane 2). Panel 3 shows the hybridization of the H70-IR-E probe to the L. braziliensis chromosomes. (D) Graphical representation of the deduced physical map for HSP70 locus in L. braziliensis. Small red boxes represent the 5' UTR; light blue boxes the 3' UTR-I, dark blue one the 3' UTR-II, and green boxes the ORFs. 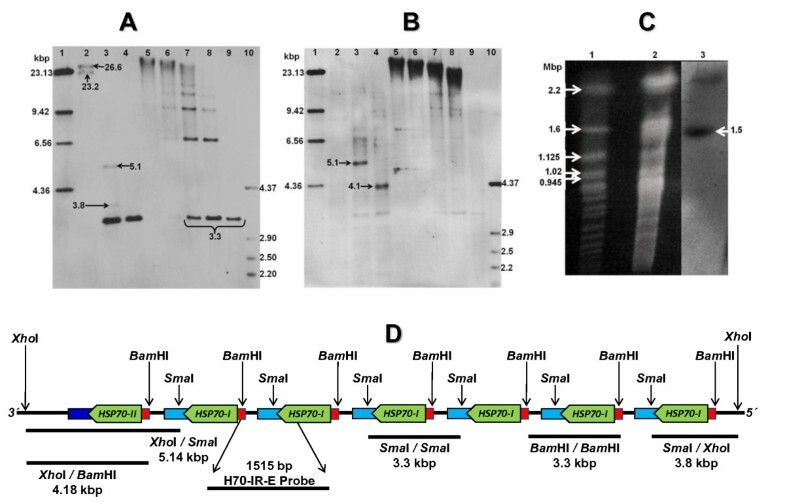 Hybridization of the membrane with the 3' UTR-II probe showed a sole hybridization fragment (5.1-kb in Xho I+Sma I digested DNA, and 4.1-kb in Xho I+Bam HI digested DNA) (Figure 8B, lanes 3 and 4, respectively), in agreement with the existence of a unique HSP70-II gene, which was located at the 3' end of the locus (Figure 8D). According to the number of fragments observed in the lanes containing Bam HI partially digested DNA (Figure 8A, lanes 5 to 8), and taking into account the size of the hybridizing Xho I-fragments which should contain the complete locus (Figure 8A, lane 2), it was estimated the presence of around seven HSP70 genes in the L. braziliensis HSP70 locus, as is shown in Figure 8D which summarizes the genomic organization of the L. braziliensis HSP70 locus. The presence of two hybridization fragments, larger than 20 kb, in the lane containing Xho I-digested DNA (Figure 8A, lane 2) has no direct explanation. Two hypotheses may be invoked to explain this unexpected finding. On the one hand, it can be postulated the existence of two identical HSP70 tandems that, furthermore, should be found in the same chromosome. Thus, PFGE separation and hybridization assays showed that HSP70 genes are located in a chromosome of approximately 1.5 Mb (Figure 8C), which would correspond to the chromosome 28, according to the location of the HSP70 locus in the GeneDB database. The other hypothesis is the existence of allelic polymorphisms either within the locus (affecting the number of HSP70 gene copies) or in its boundaries (affecting one of the Xho I restriction sites). Although the size and hybridization intensity of these Xho I restriction fragments supports the second alternative, and the resolution of the PFGE assay do not permit distinguish between the two size different sister chromosomes, further work is needed to clarify this finding. The present work was intended to establish the genomic organization of HSP70 genes in L. braziliensis. Firstly, by RT-PCR and cloning, we identified two types of 3' UTR sequences, demonstrating that also in L. braziliensis two types of HSP70 genes exist, a feature shared with other Leishmania species. In addition, our analyses support the existence of at least seven HSP70 genes arranged in a head-to-tail manner. In summary, the HSP70 locus in L. braziliensis, like in Leishmania subgenus species, is composed of the two types of genes (HSP70-I and HSP70-II), the number and the relative position of these genes being very similar in the Leishmania genus. This finding is of especial value taking into account that L. (V.) braziliensis complex is considered as the earliest divergent species of the genus Leishmania. The strict conservation of the HSP70 gene array in all Leishmania species analyzed suggests that this type of arrangement must have an important functional role. Indeed, as recently reported, the HSP70-II gene in L. infantum is extremely relevant for virulence and intracellular survival of the parasite . Additionally, we have experimentally mapped the 5' and 3' UTR of both types of HSP70 genes of L. braziliensis. After comparing with the genomic sequences, the position of processing signals, such as the trans-splicing and polyadenylation sites as well as the C-rich polypyrimidine tracts, were determined. The distance between these elements is in agreement with previously reported range of distances . Former studies in L. braziliensis reported that after probing the mRNA blot with the HSP70 coding region, two hybridization RNA species very close in size were observed, corresponding the lower molecular weight species to that hybridizing with a 3' UTR-I probe . Our Northern blot analysis supported these findings and revealed that the larger RNA corresponds to the HSP70-II transcript, confirming the existence of the HSP70-II genes in this parasite. Although, the size difference between these transcripts could not be explained by the sole difference in size of both 3' UTRs, it is likely that the differences are due to different length of the poly(A) tail [42, 43]. Noticeably, it is considered that unstable mRNAs carry shorter poly (A) tails [44, 45]. Northern blot assays showed that the steady-state levels of both transcripts are not affected by the temperature of incubation. Consequently, in contrast to the species of the Leishmania subgenus, L. braziliensis HSP70-I transcripts are not stabilized upon heat shock. activated protein kinase c receptor (guanine nucleotide-binding protein beta subunit- like protein). CJP's lab was supported by Colciencias (Colombia), Research project No. 1203-405-20233. JMR's lab was supported by grants from the Ministerio de Ciencia y Tecnología (BFU2009-08986) and the Fondo de Investigaciones Sanitarias (ISCIII-RETIC RD06/0021/0008-FEDER). CAR was supported by Colciencias, Programa Nacional de Doctorados, convocatoria 2008. CAR, JMR, and CJP conceived and designed the experiments. CAR performed the experiments. CAR, JMR, and CJP analyzed the data. CAR, JMR, and CJP wrote the paper. All authors revised and approved the final version of the manuscript.